Twelve chefs, gorgeous locally grown ingredients, and an enthusiastic crowd to taste the results--our Slow Food Chef Showcase on Monday, March 19 defied the weather forecast and delivered a fun night for all. We tried a new day and time this year and added a preview for farmers to help them connect with new customers--both a success and part of our plan for next year. We also appreciate the support of the Edible Columbia staff, super volunteer Ellan Hambright, Motor Supply's Josh Streetman and his just-for-us cocktail, River Rat Brewery for donating beer for our bar, and Advintage and Grassroots Wine for providing a tasting of biodynamic and organic wines. 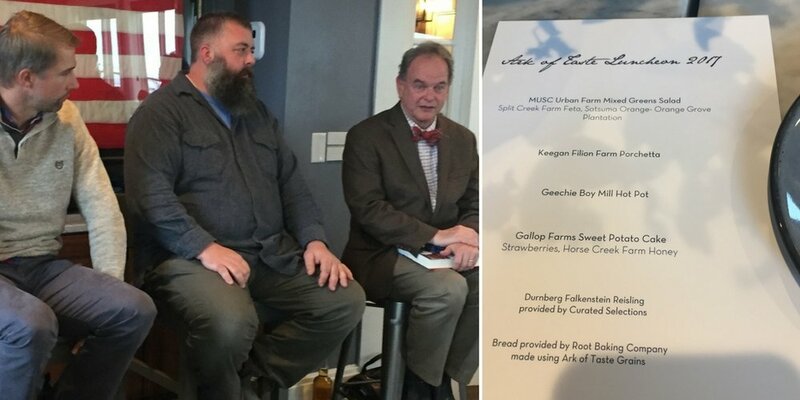 The state's strong role in Slow Food Ark of Taste was clear when South Carolina chapter leaders met December 9 in Charleston to share ideas, hear from Slow Food USA leaders--and enjoy an incredible lunch featuring Ark of Taste ingredients grown in Low Country. Panel discussion on the rewards and challenges of raising Ark of Taste ingredients with (l to r) Nat Bradford, Greg Johnsman, and David Shields. And the menu for the Ark of Taste lunch, prepared by the team at The Watch rooftop restaurant at The Restoration Hotel in Charleston. 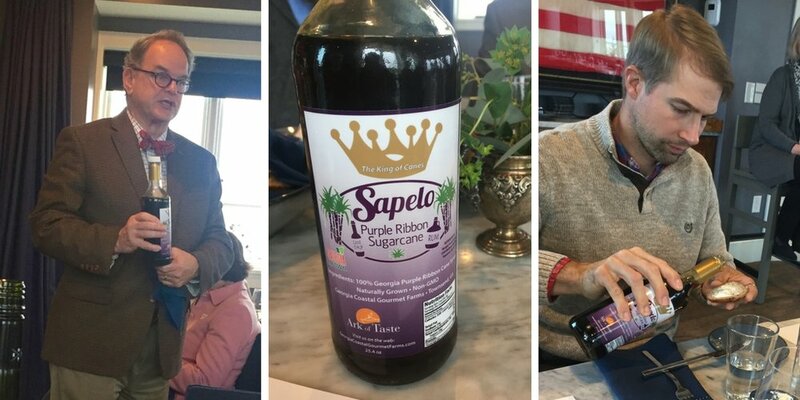 During lunch, Ark of Taste national committee member David Shields first detailed the effort to revive production of Sapelo Island Purple Ribbon Sugar Cane syrup, a process that started with an eBay discovery. You can read his account here. Dr. Shields also brought a bottle of the cane syrup and passed it around for tasting. 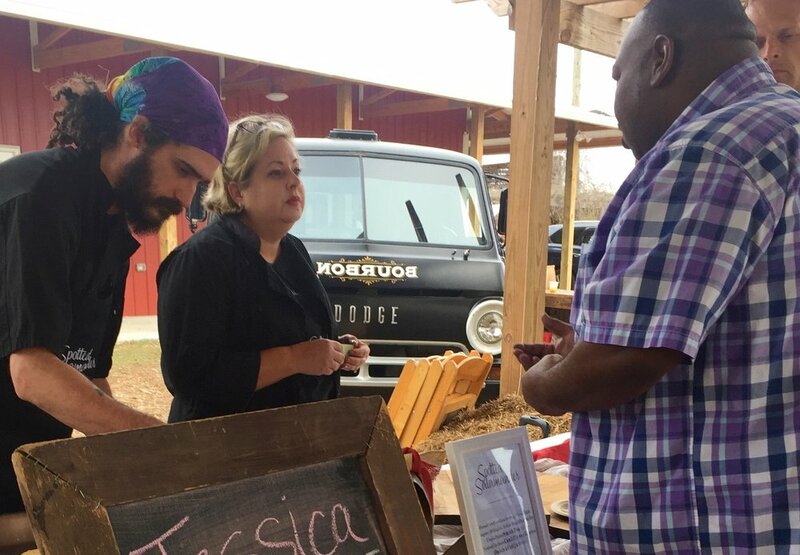 David Shields tells the story of Sapelo Purple Ribbon Cane Syrup, a bottle bearing the Slow Food Ark of Taste logo, and Nat Bradford giving it a try. Next, he moderated a discussion by a panel that included High Wire Distilling founder Ann Marshall, Geechie Boy Mill farmer Greg Johnsman, and Slow Food Columbia board member, farmer Nat Bradford. They talked about the challenges of growing heirloom ingredients and the rewards--including flavors and nutritional value not found in commerically-grown foods. This video with Nat Bradford, as he talks about growing his largest crop ever of Bradford family collards. This story from Southern Foodways Alliance about High Wire Distillery and how Ark of Taste ingredients bring unexpected terroir to their spirits. Greg Johnsman's Instagram and this article about Columbia's Crouch Distilling working with Geechie Boy Mill to produce their Jimmy Red Corn Whiskey. Keith Mearns and Jamie Browder discussing options for the ultimate school garden at Meadowfield Elementary School. His students will select the plants they want to grow from Slow Food's Ark of Taste, make their own compost to build the soil, and water the seedlings with rain they harvest with the school's rain barrel. Slow Food Columbia board member Jamie Browder teaches at Meadowfield Elementary School. His PreK class is at work on restoring seven raised bed gardens, using the square foot method inspired by Mel Bartholomew. "This week, we will pull the weeds and replenish the soil with compost. Next week, we'll order seeds from the Ark of Taste website," Jamie says. "The seedlings will be planted by October." "The vision for the garden areas is to create spaces where young children can grow "at-risk" foods with sustainable methods from our ecoregion," he says. That's why he's calling it "The Preservation Garden." It's the first phase of a bigger garden Jamie envisions creating, with the support of Slow Food Columbia. Collaborating with Slow Food board member Keith Mearns, a horticulturalist at Historic Columbia, Jamie would like to see the project grow to include Herbemont grape vines and a garden structure. We'll be posting updates on our website, if you'd like to know how you can be involved. Slow Food USA's National School Garden Program provides a number of resources for school garden enthusiasts, including how-to guides and curricula. You can find those here. Keith Mearns (left) and Eric McClam of City Roots (right) planted Herbemont grape vines at City Roots earlier this year. Photo from City Roots. There was a time when the premier vitner in the U.S. lived and made wine in Columbia. Nicholas Herbemont, born in France, moved to Columbia in 1805 and started growing grapes in the city. A little over 10 years later, he planted a six-acre vineyard, “Palmyra,” in Richland County. His success as a winemaker made him an influential force in state agriculture. In 1832, his wines were rated the best ever produced in the United States. Dr. David Shields has done extensive research on Herbemont’s work. He writes that in the early 1870s, nearly every Herbemont grape vine in the country was dug up and sent to Europe, saving the French wine industry because the hybrid was resistant to phylloxera. Herbemont grapes are again growing in Columbia, thanks to the work of Shields and Slow Food Columbia board member Keith Mearns. Mearns is a horticulturalist at Historic Columbia and planted cuttings donated from Texas A&M University at the Robert Mills House two years. Herbemont grapes on the vine at City Roots in April of this year on the left and on the right, grapes picked by Keith Mearns at the Robert Mills House, for David Shields to enjoy. Photos from Jenny Maxwell, David Shields. "The Herbemont grape plants are doing very well. They fruited profusely this year, which was exciting. The ripening was very staggered though, even within one cluster, so I'll be much more aggressive with pruning next year. We will be greatly increasing our current nursery stock of grape plants this winter and plan to have them available for sale in 2018." City Roots in Columbia planted some Herbemont vines earlier this year. Mearns says the Herbemont grape is being nominated for inclusion in Slow Food's Ark of Taste. Nat Bradford and Howard Conyers taking the best of South Carolina to Slow Food Nations this summer. 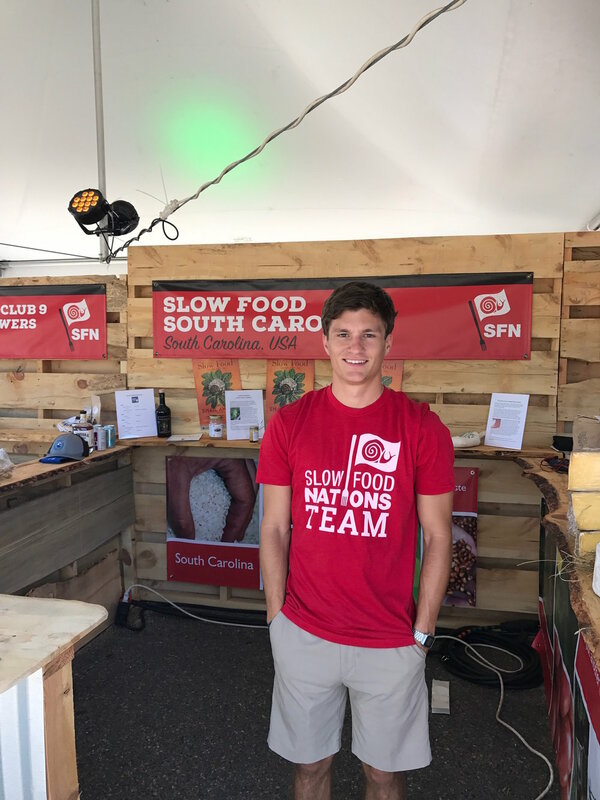 South Carolina was well represented at Slow Food Nations in Denver. The state's chapters collaborated on an exhibit for the Taste Marketplace and sponsored a scholarship for Slow Food Columbia board member Nat Bradford to attend and talk about Bradford watermelons. He was joined by other Columbia members Vanessa Driscoll Bialobreski, Kristian Niemi and Niko Pavlos, along with Anson Mills' Glenn Roberts, USC professor Dr. David Shields, and Manning barbecue expert Howard Conyers. Special thanks to Beth Kunkel of Slow Food Upstate for organizing the S.C. exhibit. 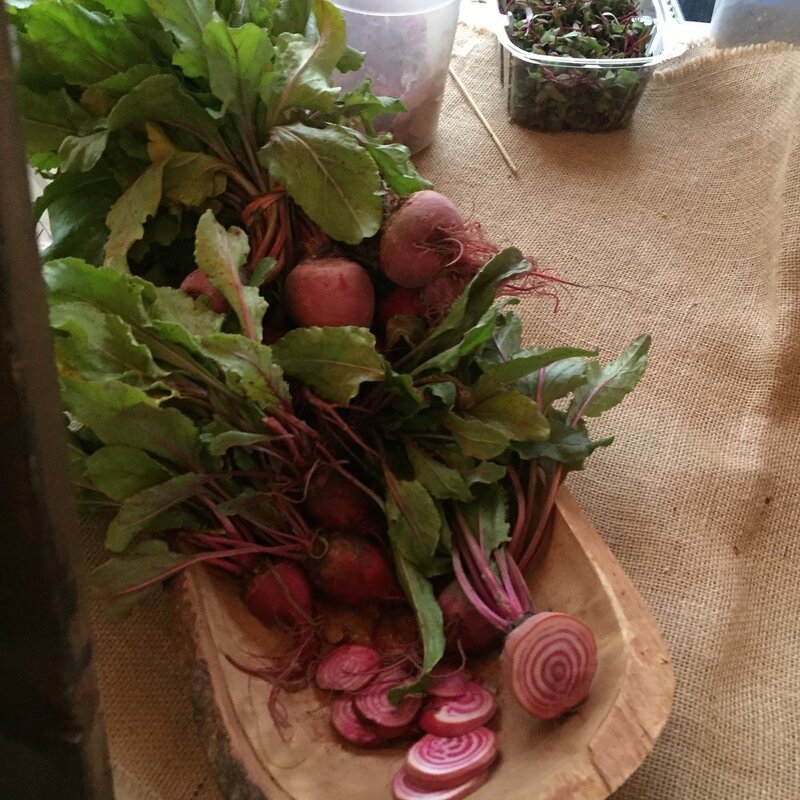 Here's an interview with Nat at Slow Food Nations, from Heritage Radio Network. In these photos taken by Vanessa and Kristian, you can see snail art in the streets of Denver, a school lunch as envisioned by Alice Waters, Waters speaking to delegates at that lunch, and S.C. 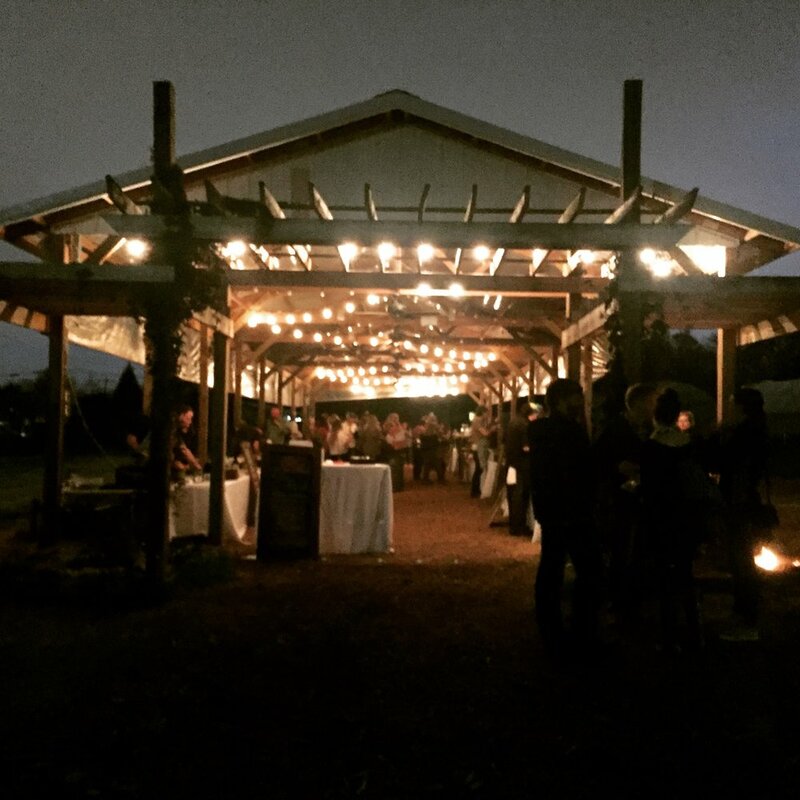 Slow Foodies on panels and volunteering at Taste Marketplace. Nat Bradford will be telling the world about his family's heirloom Bradford Watermelon at Slow Food Nations in July. Slow Food USA expects to welcome 20,000 people from around the world to its food festival in just a few weeks. 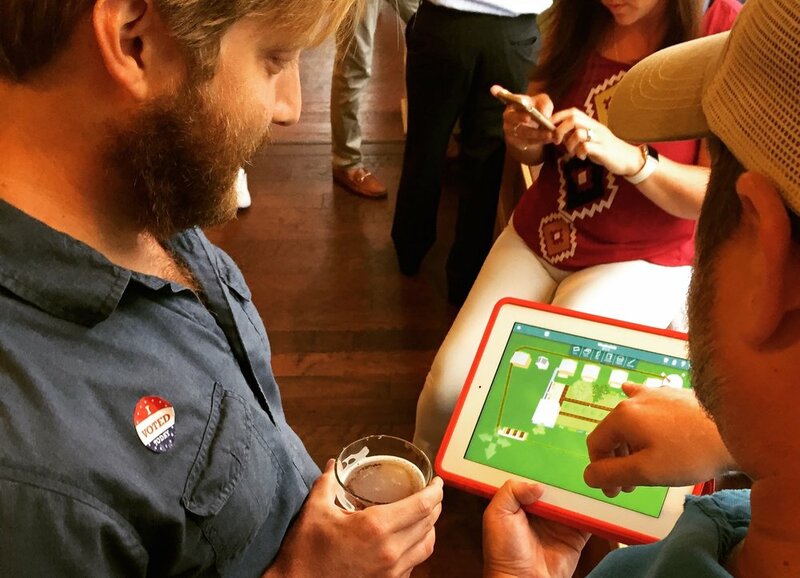 They'll find a lot to learn about and love from our Columbia Slow Food chapter. Our board member Nat Bradford is an Ark of Taste producer, and we're helping to send him and board members Vanessa Driscoll Bialobreski and Kristian Niemi as delegates. 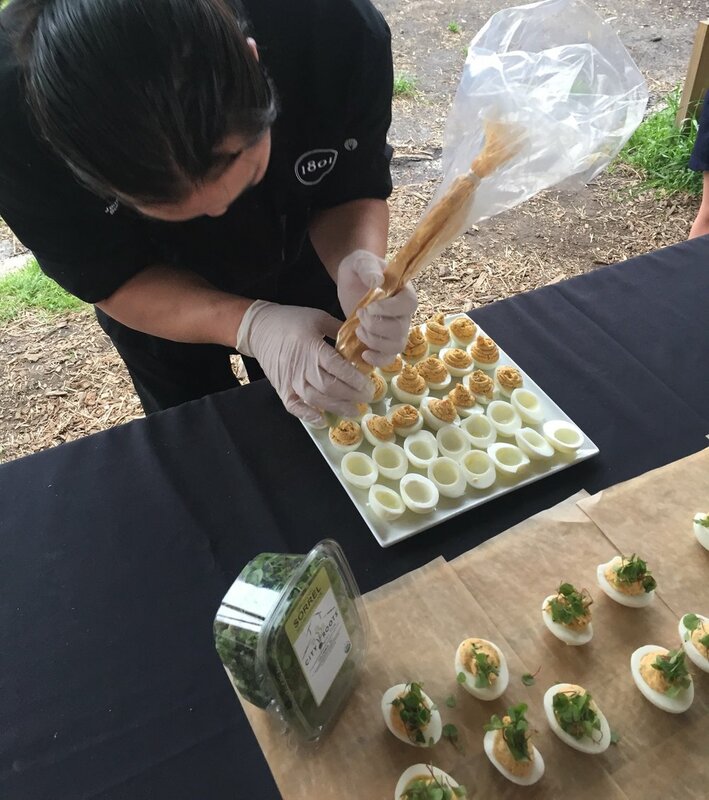 We're also partnering with Slow Food chapters in Charleston and Greenville to showcase Ark of Taste ingredients that come from our state, with a a booth at the conference. Slow Food Nations takes place July 14-16 in Denver, with free public events on Saturday and Sunday. You can also read more here about Nat and the "sweetest watermelon of the South."